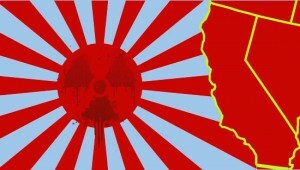 RAD NEWS DIGEST I coverage from March 11, 2011 through December 1, 2012 HERE! Charles Perrow, a professor emeritus at Yale University on fuel rod removal at Unit #4 Fukushima. Emission of spherical cesium-bearing particles from an early stage of the Fukushima nuclear accident. TV: “Like they’re melting… a lot of melting sea stars out there” says Seattle biologist — Veterinarian: It’s concerning, in under a week roughly 60% of species are sick or dying — “Same thing happening near Canada and nobody’s sure why. Cesium 137 detected in Canadian mushrooms. Long-shadow of Chernobyl – Organic Blueberry spread imported from Italy hads 164 Bq/kg Cesium 137. Simply information submits a series of proposals to Japan. “The tuna that were caught off San Diego with the Fukushima cesium isotopes, they were 10 to 20 times lower than they had been off Japan. Now the new releases, the leak from the tanks – they’re changing in character. Strontium 90 has become of more concern because it’s a bone-seeking isotope. That will stay in fish much longer,” he said. Special Report: Help wanted in Fukushima: Low pay, high risks and gangsters. A Road Less Taken: Energy Choices for the Future. Researcher: High death rate, ‘puzzling’ behavior in B.C. orcas. Resident killer whales off B.C. coast go mysteriously quiet. Fukushima Nuclear Crisis Update for October 19th to October 22nd, 2013. Dr. Helen Caldicott on Fukushima and the Perils of Nuclear Power. 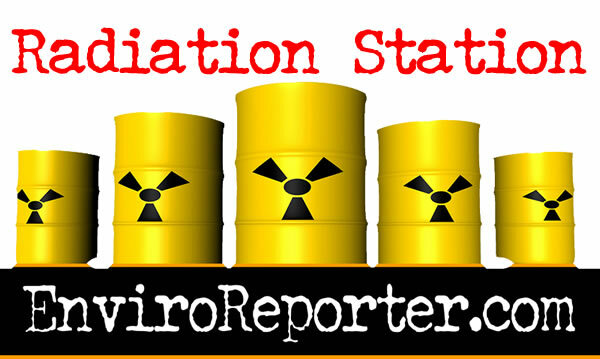 Fukushima-like Columbia Generating Station must close. Union of Concerned Scientists: What are accidents and transients? Radioactive cesium levels spike in ocean near Fukushima as stricken plant braces for super-typhoon. These new charts show clearly: nukes are more expensive than renewables in Europe, and discrepancy is growing larger. Michael Collins Radiation Update (21 October 2013): One hour special that covers much of the radiation challenges facing us today regarding Fukushima, nuclear power safety and the never-resting nonsense spewed by pro-nukers in the media such as the New York Times. 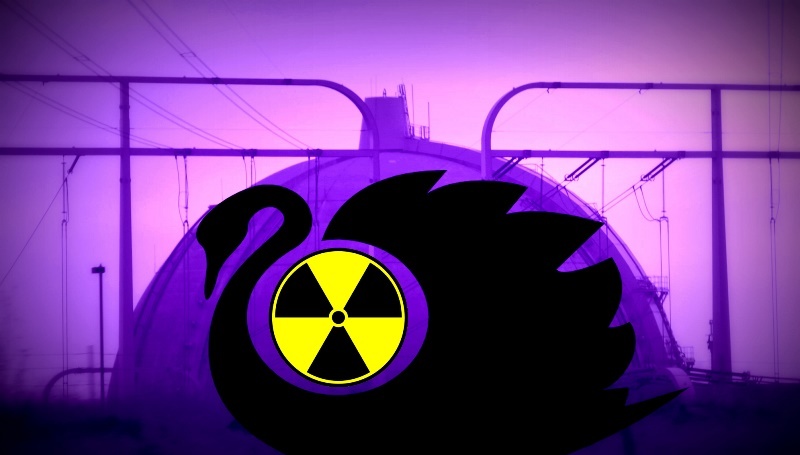 The series listeners have been waiting for, Black Swan SONGS, is finally out describing in five pieces and 23,000 words the threats facing the spent fuel at the San Onofre and Peach Bottom nuclear generating stations. Discussion moves to story of an experienced yachtsman making the Pacific Ocean trek first from Australia to Japan and then onto North America. Sea life is near non-existent for thousands of miles save for a huge whale floating on top of the water with a massive head tumor. “The Ocean is Broken” may be a ‘fish story’ but if it isn’t, the tale it tells is hopelessly heartbreaking. Jeff and Michael discuss next typhoon bearing down on Fukushima and the massive spikes in radiation readings that previous storms over the stricken plant have left in their wakes. Even with persistent poisonous radionuclides recently found in British sediment bordering the Irish sea, the UK government announces the construction of two new nuclear reactors on its southern coast. Michael points out that the British taxpayer will be on the hook for billions in this outrageous government giveaway. US Pacific Coast seaweed is again found contaminated with Fuku goo in the form of cesium-134, cesium-137 and cobalt-60 which suggests ongoing fission at the Japanese site of the triple meltdowns. 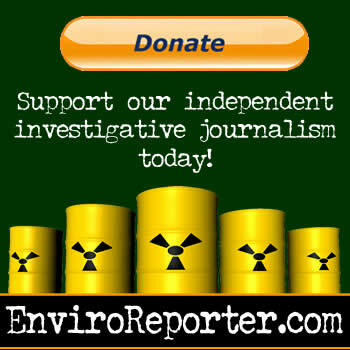 Sad state of the media in which New York Times dismisses Fukushima radiation and lauds new EPA rules that radically raise amounts of allowable radiation in emergencies, a dangerous plan first exposed months ago in EnviroReporter.com with EPA Nukes Radiation Rules. Happy, though small, state of citizen awareness as 500 people gather on San Francisco beach forming a human chain reading “FUKUSHIMA IS HERE.” Michael discusses $60 billion US government is planning to spend ‘modernize’ its nuclear weapons complex suggesting money would be better spent tracking and addressing Fuku goo. US EPA says “To this day, the [RadNet] system continues to confirm that there are no harmful levels of radiation in the air reaching the U.S. from Japan,” an EPA spokesperson said in the last week when EnviroReporter.com‘s own US EPA RadNet graphs data shows upward spikes in beta radiation in Phoenix AZ, Anaheim, Fresno & Los Angeles CA, Albuquerque NM, Corvalis OR, Amarillo TX and Charleston WV. One of the best shows in over 2.5 years of bringing radiation information to a growing international audience. Michael..what a great way to start a New Year! It is just way beyond terrific to have all of these important articles, with their links, all listed on one page. First of all, it is really impressive to see that there are so many recent articles that MUST be read, and second…it is wonderful not to have to go hunting for them. I just wish I had the time back that I have spent in the past, trying to locate these articles, in order to forward them to friends, in an attempt to inform and educate them as to the nuclear crisis that is going on, thanks to Fukushima. I just wish that the US Government would go and do likewise! While I know that there are certainly articles on this potential global disaster to be found in some small newspapers, I have not, so far, found anyone, anywhere, who has been tackling the whole Fukushima disaster, head on, as you have been doing. And, in addition, you have also written many articles, plus, now, a five part series, on our local nuclear and toxic chemical contamination on the Santa Susana Field Laboratory. I cannot believe how incredibly lucky that we all are to have you here in our midst, doing your knowledgeable environmental reporting, without which we would basically all be in the dark, when it comes to understanding and interpreting everything that has been happening in California, the USA, and the World. My hope is that in 2013, you, and also Denise, will continue to have the concern, energy and courage to keep investigating and writing about all of these issues, which affect the health and welfare of all of us.